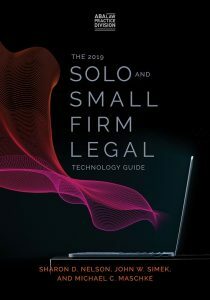 Now Available – The 2019 Solo & Small Firm Legal Technology Guide | SENSEI ENTERPRISES, INC.
We are very excited to announce that the 2019 Solo and Small Firm Legal Technology Guide by Sensei’s Sharon Nelson, John Simek, and Michael Maschke is now available! Just published by the ABA, “The 2019 Solo and Small Firm Legal Technology Guide” helps lawyers find the leading and most cost-effective technology for their practice. Authors and industry experts Sharon Nelson, John Simek and Mike Maschke continue to provide reliable recommendations and up-to-date suggestions with the 12th edition of this well-established handbook. Attorneys need to keep pace with the latest in legal technology, but many solo or small firm lawyers cannot afford the luxury of a tech consultant. “The 2019 Solo and Small Firm Legal Technology Guide” provides a quick, easy read of all the information lawyers need to know, allowing attorneys to ensure the firm can capitalize on technology to enhance productivity and client service. The authors keep this new volume streamlined with thoroughly vetted, vendor-neutral product selections that change annually with the best of legal tech, along with details of how and when to upgrade.